Finally, I think a unique aspect of our event is the interplay between government executives and private sector marketers. We have ambassadors, many current and former government officials, that act as mentors to marketers, providing insight into what is happening on the government side. Is this event primarily for private sector professionals? It was designed as a resource for marketers working at private sector companies, but we're actually seeing an increase each year in the number of government employees attending as marketers. With the increase in communities of practice, cross agency initiatives, and shared services, government employees are being asked to market their programs much the same way vendors do. Additionally, our event has great content around social media strategies. Many government teams, even if they are not in "marketing" roles are increasingly relying on social media to communicate with citizens. What speakers or sessions are you most excited about? Our invited keynote is Suzette Kent, Federal CIO, OMB. We are so excited to have her participate to share her vision for technology and information management across government. We also have a keynote focused on mindfulness. Professionally, our GAINers are in a high stress, fast-paced environment. This session is about stepping away from all of our screens and taking the time to "notice." Truly taking a step back to see if things can be done differently. I think everyone will walk away from this presentation with a new perspective on how to get work done. This year we're launching an awards program, the GAINERS. These awards will recognize marketing campaigns that have raised the bar and really fulfilled the promise of this event in terms of growth, innovation acceleration, and networking. We've got several categories including agency-based marketing, events, partner marketing, and more. 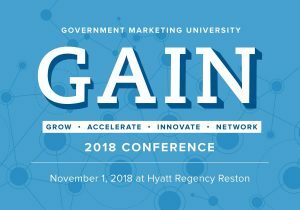 GAIN 2018 is taking place November 1 in Reston, VA. For more information or to register visit the GAIN website. Thanks to Lou Anne for sharing this inside look at the show. I know we GAINed a lot (sorry...could not resist). This entry was posted in Event News, Gov/Mil News and tagged education, event planning, marketing, professional development, Social Media by Kerry Rea President of GovEvents. Bookmark the permalink.